Cholaca’s 100% pure liquid cacao is available in several varieties and sizes designed specifically for food service locations like coffee shops. 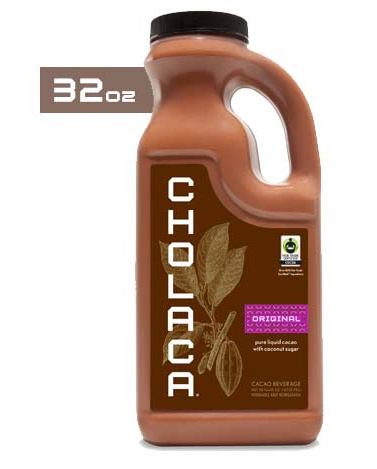 Cholaca’s pure liquid cacao is offered in three varieties: unsweetened, original and sweet, and is made from only three ingredients, with no preservatives, emulsifiers or additives. Our Food Service partners such as Ozo Coffee, have been able to bring new and unique recipes to their discerning customers by using our various Cholaca products for their food service menu’s. We source our cacao directly from farmers and co-ops in Ecuador and Colombia who are 100% committed to regenerative farming practices. So, relax and enjoy our sustainably sourced, vegan, gluten free, dairy free and paleo friendly 100% pure liquid cacao today. Please contact info@cholaca.com to setup a Cholaca wholesale account for your Food Service location! Cholaca is one of the most heart healthy, nutrient-dense superfoods on the planet. It is the richest source of flavonoids, iron and magnesium and also has the highest levels of antioxidants of any food. Cholaca gets its jolt from two hundred different phytochemicals. Some of these phytochemicals increase endorphins including theobromine, a lasting stimulant that quite simply makes you feel amazing! Cholaca sources cacao beans from select farms in Ecuador and Colombia that utilize regenerative farming practices.